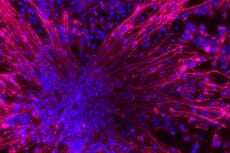 Two articles published in Science and Translational Medicine employ stem cells to treat neural damage. Working with a mouse model, researchers led by Stephen Back, MD, PhD, Oregon Health and Science University, transplanted neural stem cells to de-myelinated mice, which resulted in increased and effective myelination. Stemming from these findings, researchers led by David Rowitch, MD, PhD, University of California San Francisco, implanted stem cell-derived neurons into four boys as part of a phase I clinical trial to treat Pelizaeus-Merzbacher disease. Patients with the disease suffer from neuron damage due to stripped axon-insulator myelin. Imaging revealed increased myelination, and exam showed improved motor function. This initial trial will enter its next phase to specifically assess efficacy of treatment.